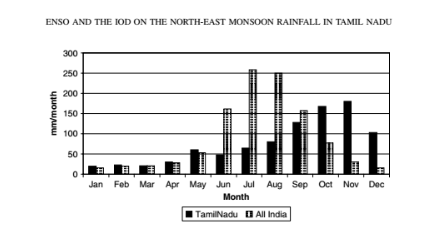 El-Niño years have been shown to increase the amount of rainfall recieved by Tamil Nadu during the Northeast Monsoon; conversely below average rainfall occurs during the Northeast monsoon in La Niña years. Geethalakshmi, V., Yatagai, A., Palanisamy, K., & Umetsu, C. (2009). Tamil Nadu State in south-eastern India receives most of its rainfall from October through December, a phenomenon known as north-east monsoon rainfall (NEMR). Tamil Nadu’s south-west monsoon rainfall (SWMR), received between June and September, correlates positively with the Southern Oscillation Index (SOI), whereas NEMR correlates negatively.We undertook a study to investigate the relationship between global teleconnection indicators, namely the El Ni˜no-Southern Oscillation (ENSO) and the Indian Ocean Dipole (IOD), and precipitation over Tamil Nadu during NEMR. The results showed that NEMR had significant positive correlation with Ni˜no-3 sea-surface temperatures (SST) in July. The statistical relationships between the IOD and NEMR were much weaker than those between ENSO and NEMR. To understand the relationship and/or local dynamic structure, composites of the circulation field for the extreme El Ni˜no/La Nina years were compared with the mean state for July, September and November. Composite circulation analysis clearly showed that in extreme El Ni˜no years, the Bay of Bengal exhibited a positive sea-level pressure (SLP) anomaly, and the Arabian Sea exhibited a negative SLP anomaly, which resulted in strong north-easterly winds, bringing moisture and precipitation to the southern part of India in November. The reverse was also true: A strong negative anomaly was observed in the Bay of Bengal during La Ni˜na years, which resulted in a weak NE monsoon. However, local circulation anomalies (Bay of Bengal through Arabian Sea) did not continue from July to November. Copyright  2009 John Wiley & Sons, Ltd.
India Development Report (2012–13) India’s Experience with Reforms.